Week Seven of the seventh series of The Great British Menu and it's the turn of Wales. Over eight weeks, twenty four of Great Britain's finest chefs are competing in regional heats for the opportunity to create a four course menu at an Olympic banquet, hosted by sporting legend Sir Steve Redgrave with a guest list of British sporting greats. Week Seven of the seventh series of The Great British Menu and it's the turn of Wales. Over eight weeks, twenty four of Great Britain's finest chefs including many chefs from Great British Chefs site are competing in regional heats for the opportunity to create a four course menu at an Olympic banquet, hosted by sporting legend Sir Steve Redgrave with a guest list of British sporting greats. This week (starting 21st May 2012) Welsh chefs will be competing to create the final banquet. On Monday's episode, James who is part of Great British Chefs original recipe app will be preparing sage cream, onion, chicken and Welsh 'Brie' truffle toast. Richard is making a ravioli of quail, parfait of foie gras, roasted salsify and Madeira jelly and Stephen presenting "The Opening Ceremony". On Tuesday, they move onto a fish course, on Wednesday main course and on Thursday it's the turn of desserts. For each of those days they will have to impress veteran judge Angela Hartnett before going through to Friday's final. 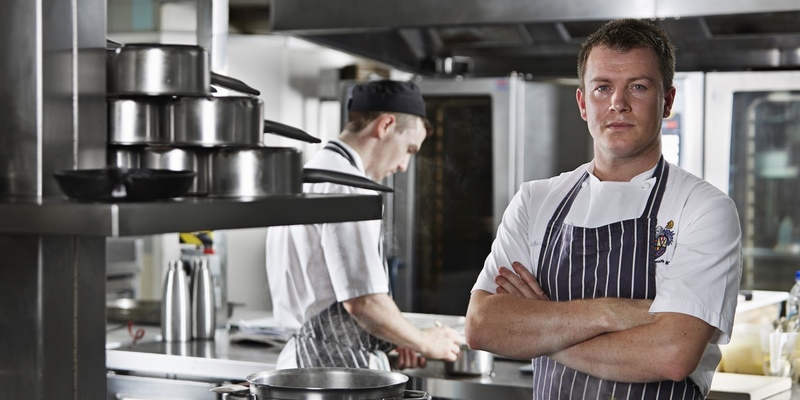 James Sommerin has impressed reviewers, guests and the judges of Great British Menu before in 2009. On Friday the two chefs who receive the most points from Angela for the week will cook their dishes again for restaurateur and cookery writer, Prue Leith, fellow restaurateur and businessman, Oliver Peyton, and food journalist and author, Matthew Fort. The winner will go into the finals (joining Alan Murchison who won the Scottish round, Daniel Clifford who won the Central round, Colin McGurran who won the North East round, Chris Fearon who won the Northern Ireland round, Simon Rogan who won the North West round and Phil Howard who won the London & South East round). Also catch up on last week's North East Heat Final Great British Menu judging on our blog.